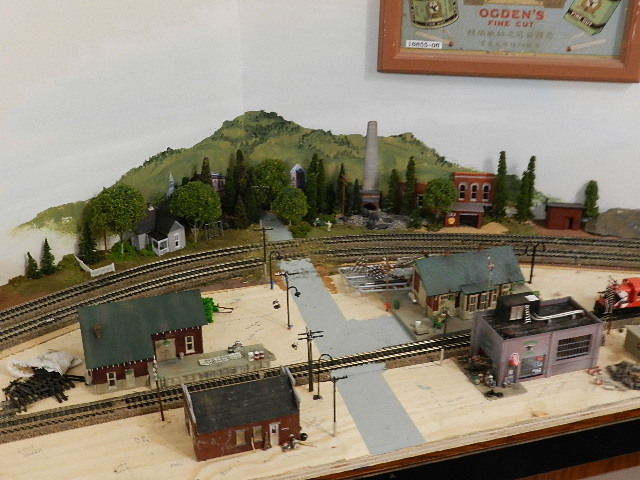 If you’re a regular visitor to this site you probably know that our group of 20 or so modelers, and non-modelers, has been tearing down and rebuilding sections of our public display layout from the very beginning some 20 years ago. The goal is to (a) keep our regular members busy honing the skills they may not have room and resources for at home and (b) present something new and interesting for our thousands of visitors who contribute to our bank account, meagre as it is. 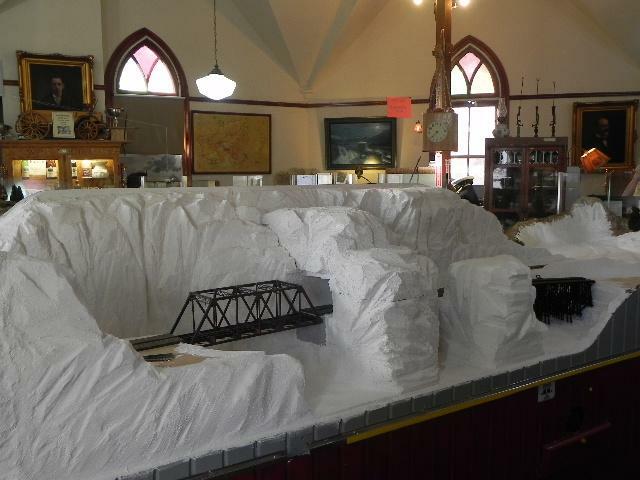 Usually these reconstructions involve a portion of that layout encompassing about 3 to 6 feet in length or just enough space to rearrange the selected track and scenery during a 6 week mid-winter slowdown in tourist traffic. This year, crazy to the end, we took on a great deal more. 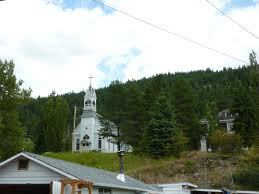 Our Myra Canyon stretched from the Chute Lake to McCulloch Station and it showed its age. 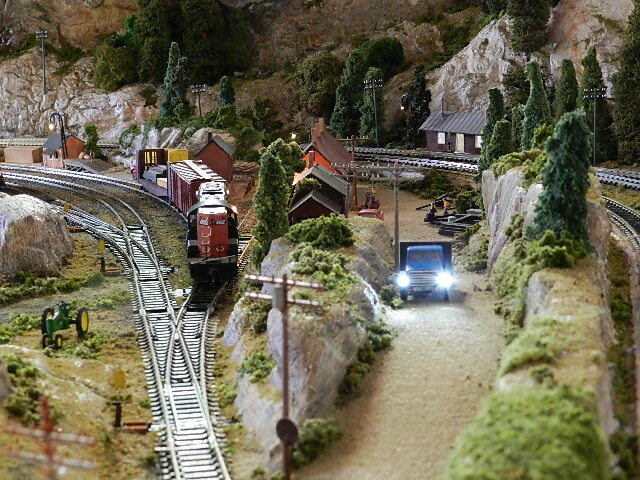 About 4 meters of track and mountain terrain would have to go. 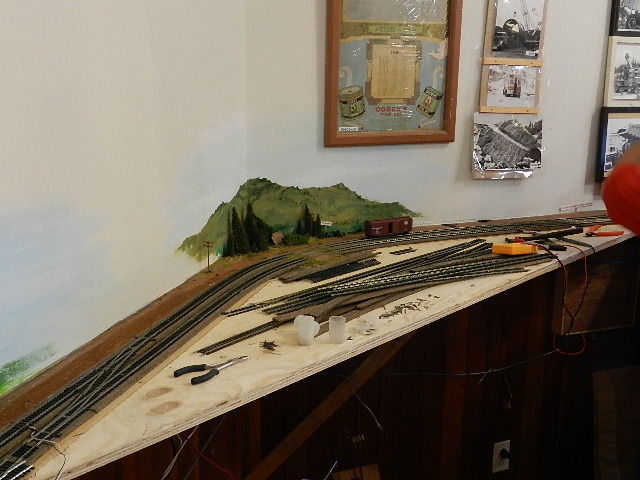 Completely new bench work, sub roadbed and scenery would have to be installed, sidings would have to be lengthened and a new logging industry would have to be created. 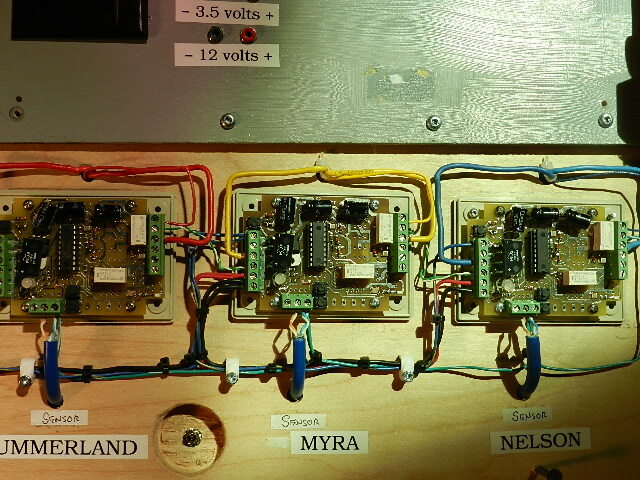 All of the old wiring under the affected part of the layout would have to be redone including the automatic start – stop feature at McCulloch Station. I never thought it would get this far again. All of the old plaster casts were removed (What a mess that was) and the old forest scenery was set aside for reconstruction and reuse where possible. 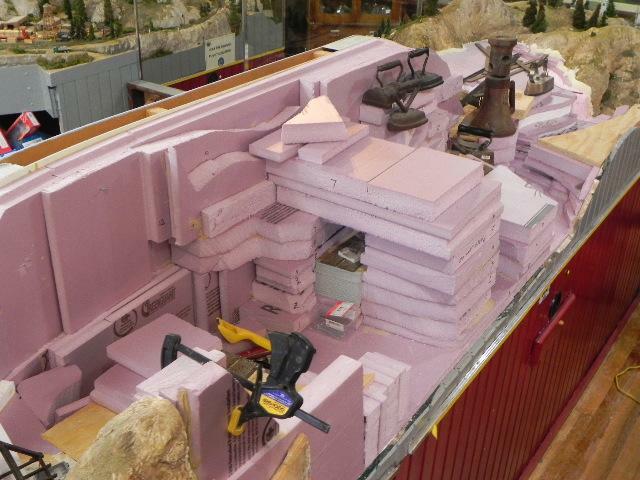 Paul Yeo took over the project then and showed us all the step-by-step method of using pink foam insulation as a foundation for scenery. What a difference that made! Thank goodness we work in a museum because there were always plenty of heavy iron items handy to use as the weights holding sheets in place while glue dried. You can already see the very basic form the canyon mountainside will take when completed. Limited public running continued while the interior main line was interrupted at this location and members worked at home building bridges and trackside structures to be added later. 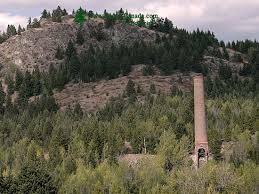 A lot of research also went into what passed for a ‘modern’ logging operation in south central BC during the 1970’s. It was all new to most of us but one member, Allan Willcocks, had made it his life’s work. He was a great data bank for the rest of us. Soon the foam was carved away and plaster was applied in a series of thin washes, light and easy to work with. 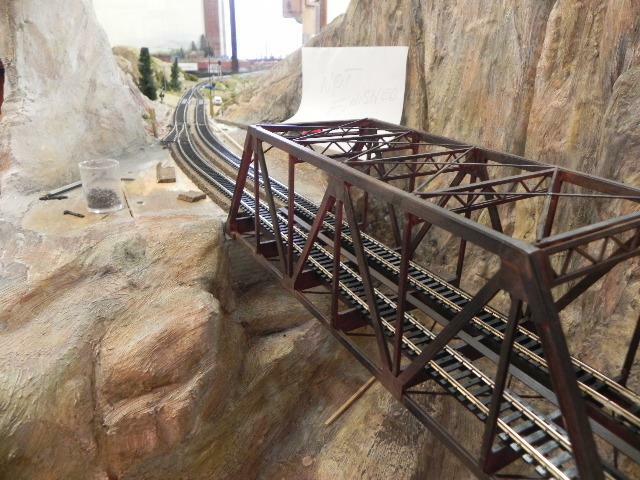 The double through truss bridge was installed and track work began from McCulloch towards Chute Lake. No. 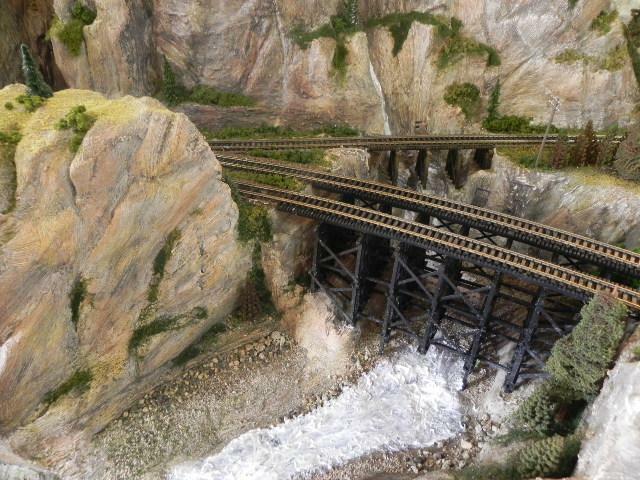 Of course there were no double track bridges in Myra Canyon but model railroading is such that you can forgo reality for operation. A situation not to be taken lightly. 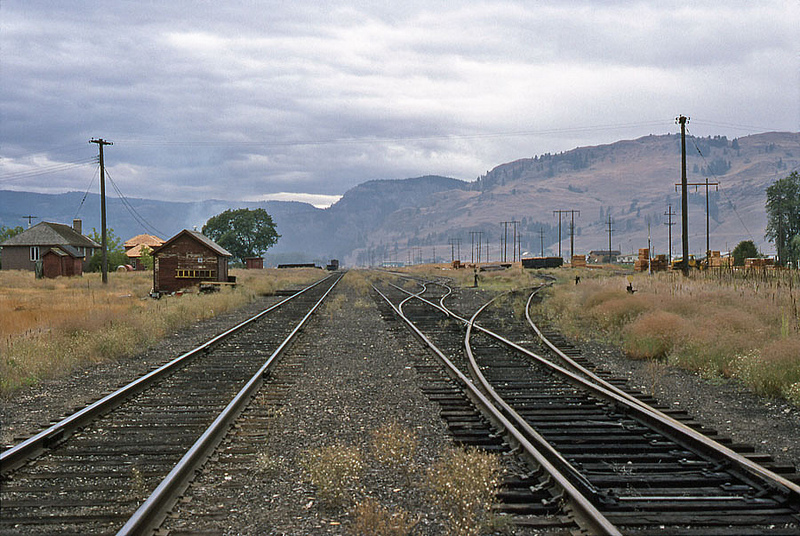 Our operation nights were planned around eastbound and westbound trains, both freight and a single passenger consist, and so a long passing siding was required between Penticton and Midway is anything was going to move at all. The real KVR never had that issue. Thy never ran 3 or 4 trains a day in two directions over the same section of track. You can see the carved ‘rock’ starting to take shape above the bridge. And as it takes shape some rules apply. The track had to be on a solid base and be and use new code 100 rail. 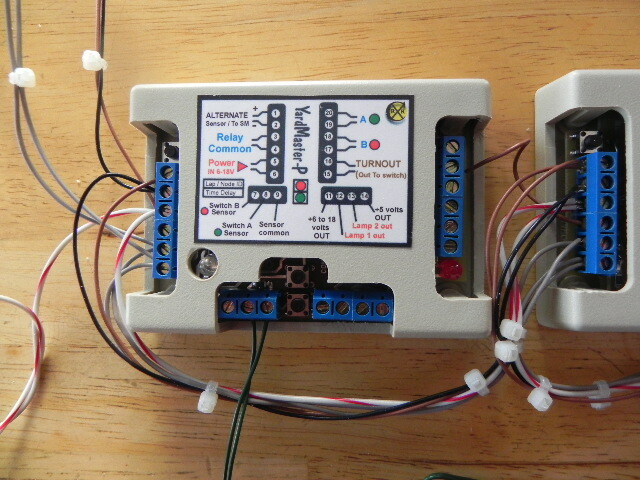 Turnouts had to be new and operated by remote control. Most of the track had to be visible so there were fewer tunnels. More bridges. Scenery had to rise as high above and as far below tracks as possible. There had to be one station in the area. There had to be only one realistic industrial area with track access. The station would be McCulloch. 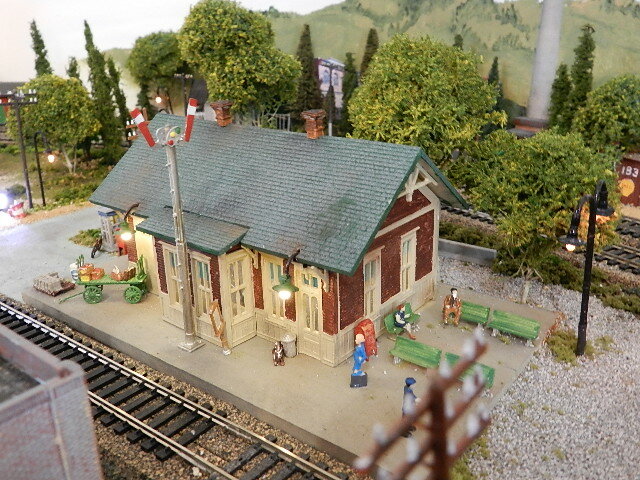 An easy choice as John Green had already recreated that lonely station with a full interior and lights. In order to reduce the loneliness just a little Arnold Stoffer built us a fine little speeder shed. The ‘industry’ had to be logging. 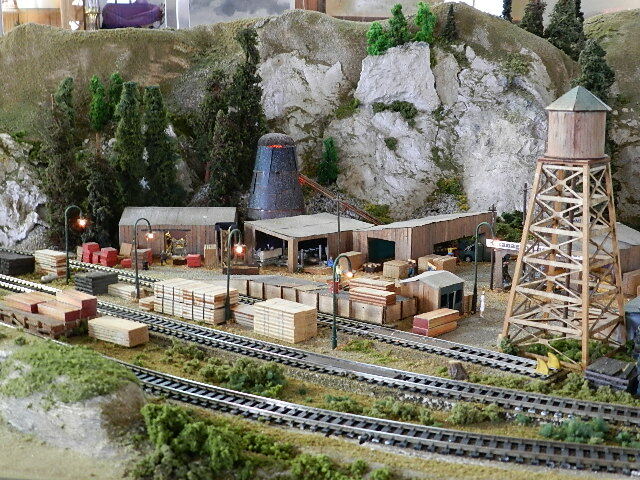 While ranching may have worked it didn’t offer the heavy equipment activity (sound and lights) that even a small log loading facility, “Myra Logging”, would offer. Flat cars, logging trucks, grapplers and men and women in hard hats are what the public relates to. Painting and detailing began in earnest as Christmas came and went. Time was no longer on our side. 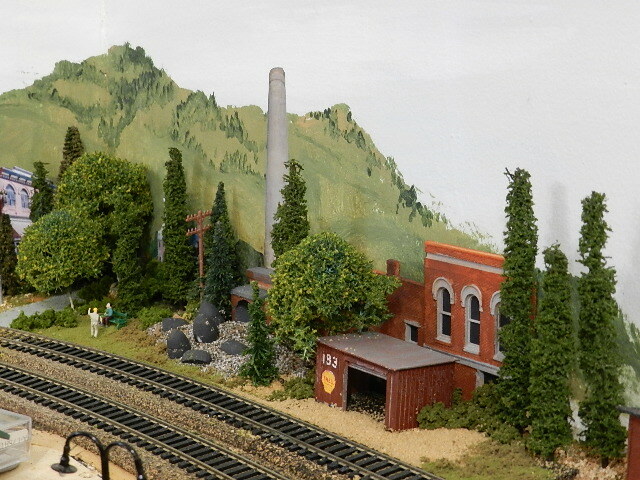 A spur was added to the McCulloch area (at the far side of the bridge) based on the theory that no model railroad can exist with a small, flat space going unused. Paul uses dry pigments for his rock face that create a realistic, and varied, representation of Okanagan geology. Raw and Burnt Sienna and Raw and Burnt Umber form the basics just as they do in real life. As noted before, all the bridges and structures were built by members working at home. This concept allows for much more club oriented activity than could take place from crowding 16 to 20 people in this small space on any given night. Most folks would be simply looking on over someone else’s shoulder. This way we took advantage of input from local history buffs, logging experts, DCC and track people, foam scenery experts and experienced structure builders. Even members who could not build something managed to donate from their own collections in order to raise the level of our finished scene. I spent my own time building trees in my garage and doing scenery early in the mornings when there was no one in the museum to see, and perhaps comment on, the mess I was making upstairs. I was working with unknown material and new shapes for the most part. The foam mountainsides were new to me and so I used the “Where will the water go?” rule as best I could when adding trees and greenery and I started to use Gloss Medium as a waterfall and river material for the first time. As an old resin or clear varnish user I really loved the effect that was offered in various magazines. What would real life bring? This photo shows only the first application of the Gloss Medium and only after the first 5 minutes. I’m very curious what it will look like when it becomes clear and the river bottom shows through. I plan another application or two and the addition of the normal deadfall material you always see along the shores of any stream. Particularly mountain streams. News at eleven. The siding at McCulloch is pretty much finished now. Adding more would only distract from the scene. 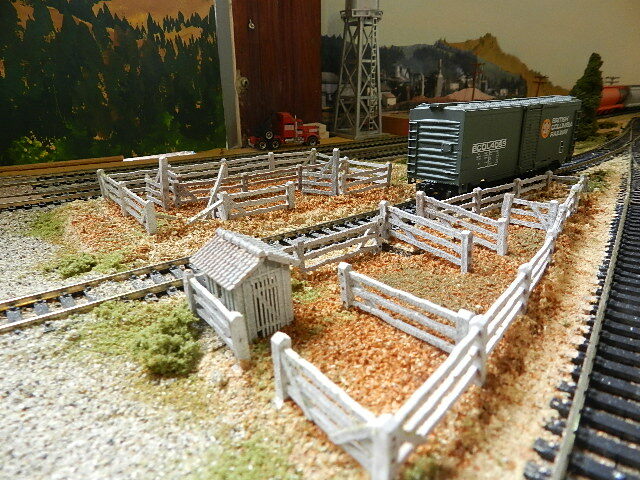 The spur is in and I added a simple wood and fill ramp so the users would gain easy access to the floor of a boxcar or flat. Incandescent lamps in the buildings were replaced with LEDs and small two dollar voltage regulators from China were set and put under the layout to keep that voltage at 3.1 VDC. Highly recommended indeed. Keeping it “busy” there are 5 people in the scene meaning there are more people in the model than there were at the actual station. Hidden in the bushes beyond the turnout are the sensors for the Yardmaster stopping and starting feature we use on this layout. If a train has stopped at the station, interrupting the sensors, an AND GATE cct contributes to the data needed to arm the public push button. Three trains at three stations and it’s ready to go. 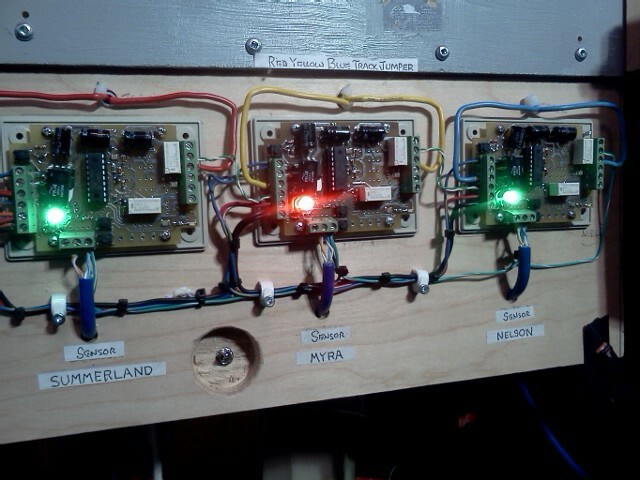 Press the button, DCC is applied to the track at the appropriate stations and the trains all leave for their next stop. 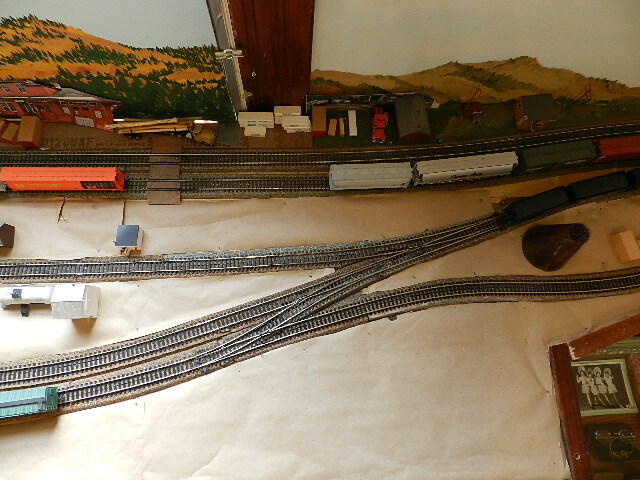 DCC remains applied to the station track until a following train arrives and DCC is turned off. The track is armed for the next time. 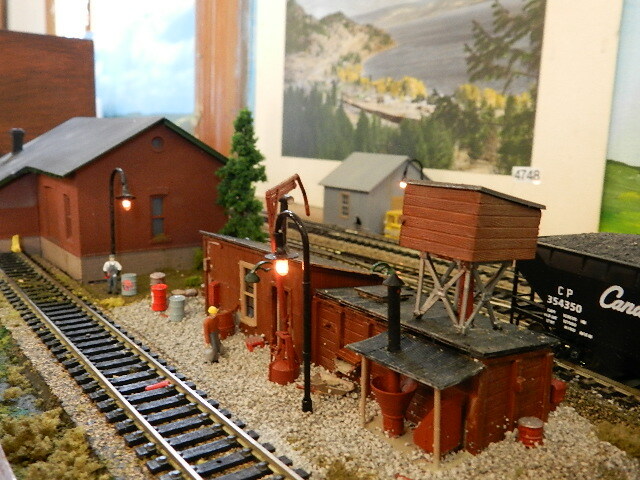 Our Myra Logging scene is just about finished at the far end of the new display. This is the west end of the canyon and the former home of a large gravel pit that never really existed but it took up an awkward space and it had a lot of lights. 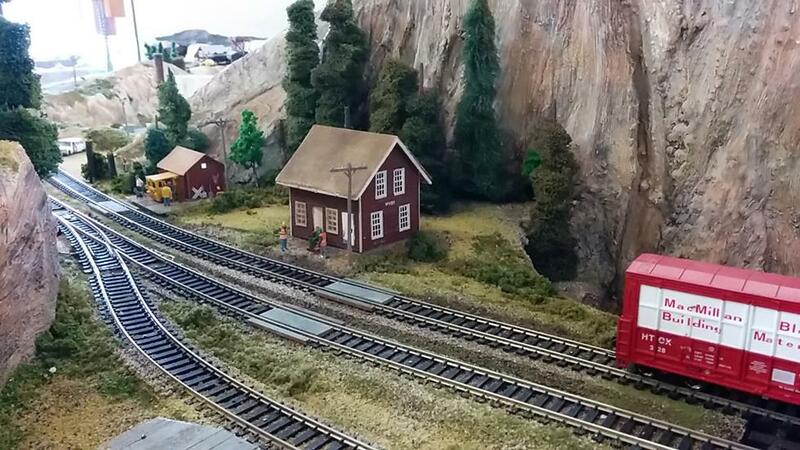 Over the next few days more trees will be added in the foreground just as there would be in real life, log cars will be realistic flat cars with stakes and a small grappler to unload logging trucks and load train cars. We may have to wait until summer to harvest realistic logs that scale out from 6 inches to 30 inches wide. More typical of the southern Okanagan. The small creek and the waterfall have not ‘aged’ yet so it still looks very white. That will change. We also acquired a small 44-toner type diesel engine of the appropriate vintage. It runs well and DCC will be installed so the log cutting group will be very well equipped to provide us with business for years to come. Our address and phone number are elsewhere in these pages and you’re all invited to pay us a visit during your Okanagan holiday this summer. World famous wine in the sun on the beach and trains. Pretty fine. Actually no, and none in all of Canada either. 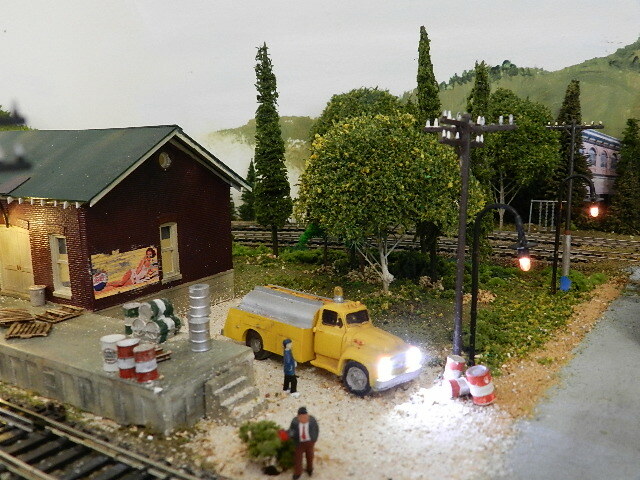 But today you will find an HO scale approximation of what “might have been” in Spanish Fork UT, right here in West Kelowna. 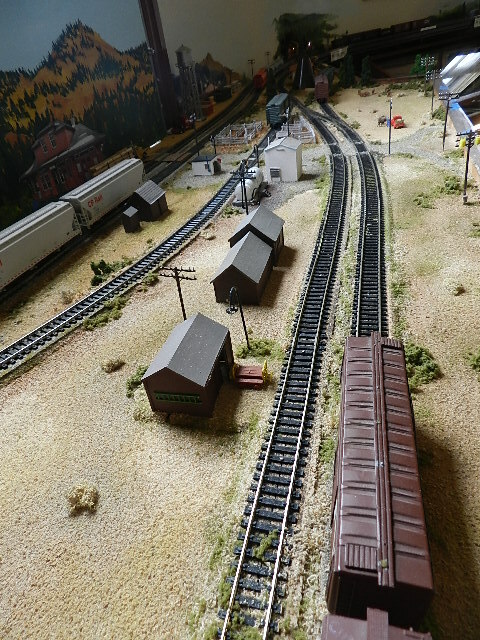 Dave Spritke, a newer member of our Central Okanagan Railroad Club has moved his 8’ two section HO Free-mo module from Utah, USA to it’s final home in Canada. Its transit included several homes via an 8000 mile journey, including Eastern Newfoundland/Labrador. Dave is in the process of integrating his Spanish Fork module into an around the room depiction of places that are, or might have been, around the Spanish Fork and Provo area of UT. Given a small room, these are necessarily being represented by place names, and a few modeled actual structures, scenes and bridges from places he visited during a three year residence in Spanish Fork. Loosely represented is the steam-diesel transition period spanning several years. 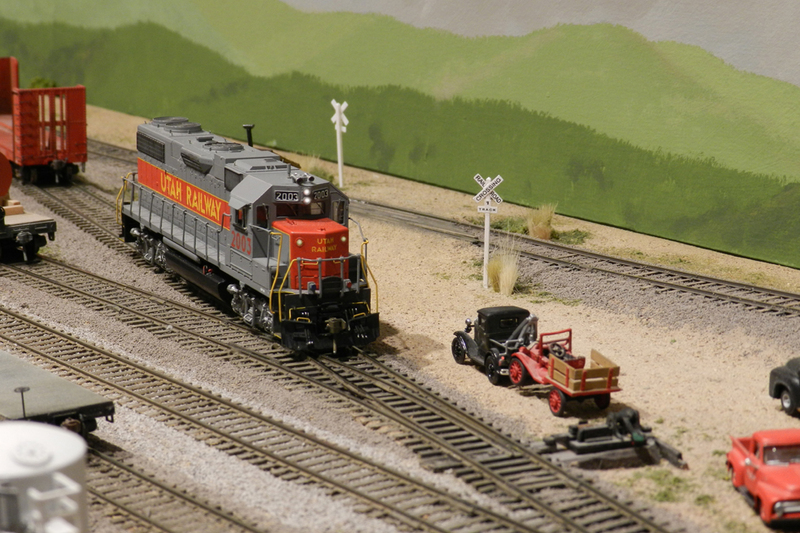 Being a D&RGW modeler and fan before arriving in UT, he soon took an affinity to the Tintic Branch of the D&RGW in particular, and also discovered and fell in love with the UTAH RY as well. Soon there was a flurry of activity in chasing trains, research of the Rio Grande in UT, and a stint working on the Heber Valley RR which operates on the former D&RGW Provo Canyon branch, plus tracing a bit of the abandoned portions of railroads in UT. 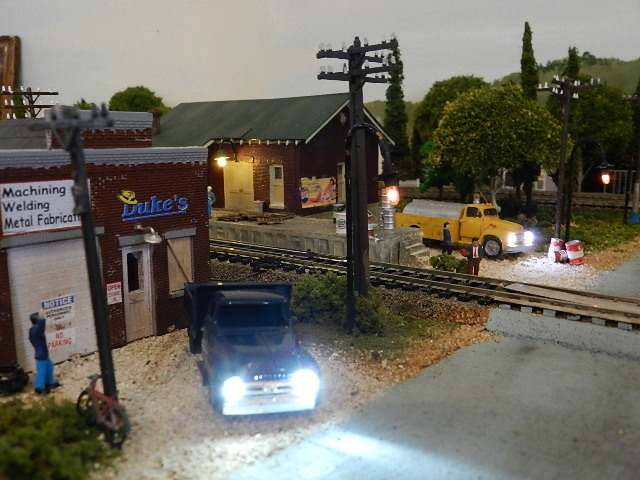 New friends provided help and needed encouragement in building a module which was then used in several Utah and Colorado meets, in addition to participating in operating on other’s model railroads. Dave reports that Utah, sometimes termed the cross roads of the west, is a relatively little known treasure of several RR’s and history. It’s train time in Spanish Fork as the 5591, with bell ringing, glides to a stop at the station. It’s a rare occurrence that a brand new F-7 passenger unit of the Grande ever visits the town which is on a branch line that is diminishing in importance, but the Grande is here showing off it’s recent purchase to the residents of towns on the line, hoping to reinvigorate passenger travel and business in general. 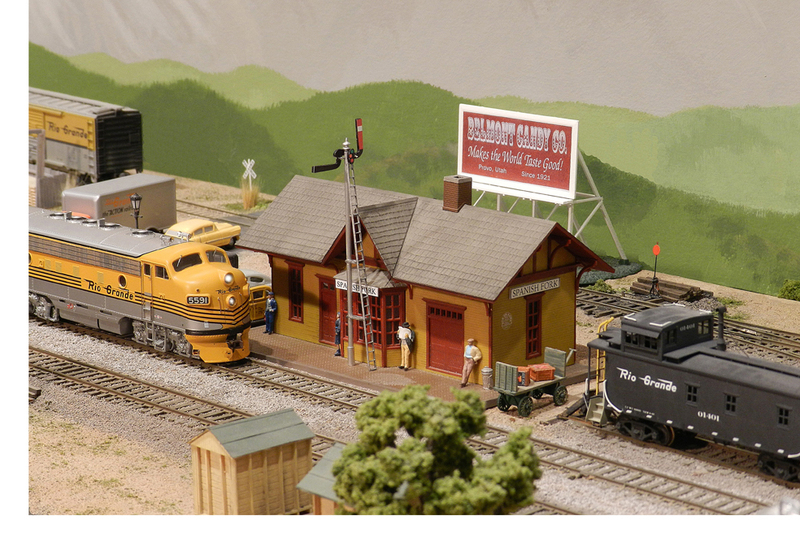 The models shown include a repainted and slightly enhanced version of a Walthers station with an Osborne models train order signal, an Athearn F-7, and a custom painted Lambert brass caboose. 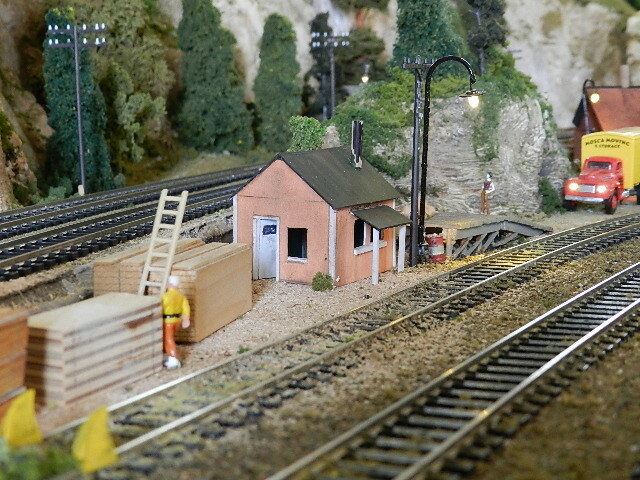 The little shed is a hard to find Wolf Designs kit/model of a prototype D&RGW work shed. A Utah Railway RSD-4/5 in fresh paint, but lacking it’s cab side number decal, is returning horsepower hours by switching Andersen’s elevator, pulling an empty car just relieved of it’s load of Potash. In the background the 5591 idles as the station just barely clear of the road crossing with it’s signals turned off to permit a Rio Grande box truck and other traffic to cross. 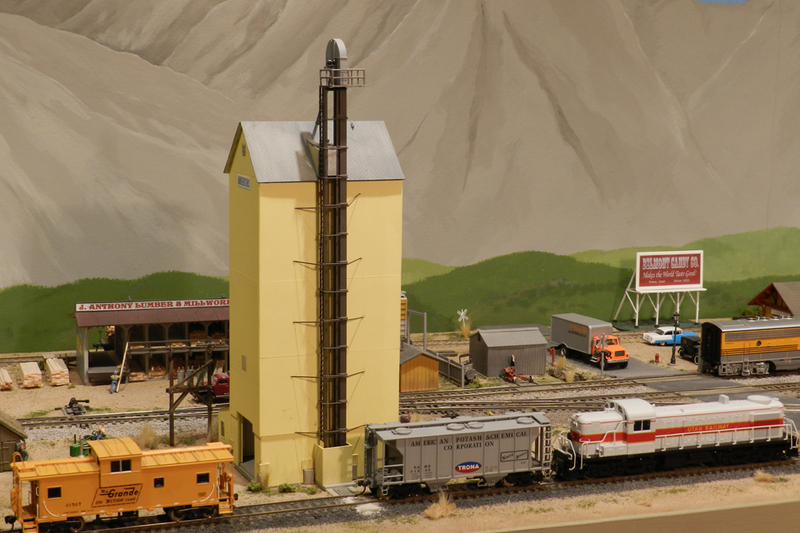 Models include the Atlas Alco RSD 4/5, Athearn wide vision caboose, and the Trona potash car, an Atlas model. Anderson’s elevator is the Spanish Fork signature structure of the module and was modeled in Evergreen Styrene via photographs and a few dimensions from ground measurements. It has several sizes and types of corrugated siding closely matching the prototypes five different types and sizes, none of which are metal. Also interesting is that instead of loading RR cars, it received granulated potash by rail car which was elevated and stored in upper level bins to be later loaded directly into trucks for hauling to the regions agricultural fields. The structure, abandoned in place many years ago, was still in Spanish Fork in 2017. Sometime, ask Dave about this structure and how it came to prominence on his module. Yet another Utah Ry locomotive is working off horsepower hours on the Tintic Branch in Spanish Fork. It has just set off a bulkhead flat and appears to be ready to help with the tow of an old truck. The model 2003 is an Athearn Blue box kit, with a custom painted and decaled shell, but otherwise an original blue box kit. 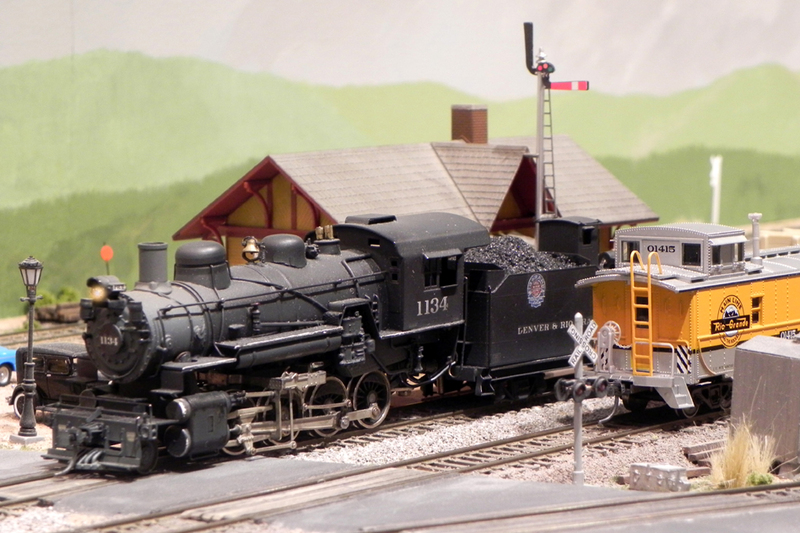 Dave repowered, upgraded and detailed the loco and detailed it to match the prototype. The prototype Utah Ry 2003 was originally an SP GP 35R and rebuilt to a GP38-2, losing 500 hp in the process, but retained it’s original GP-35 body. It reportedly continues to serve the area, but wearing the colors of the RR’s new owner, Genesee and Wyoming Industries. It’s rare to see steam locos these days, but D&RGW 1134 still serves the Tintic Branch hauling large quantities of rich mineral ore, grain, and ballast rock for company use. The C-48 class 2-8-0 makes it’s weekly appearance a brief but noisy passing through Spanish Fork on it’s way to the nearby mainline, and then on to Provo where it’s based. 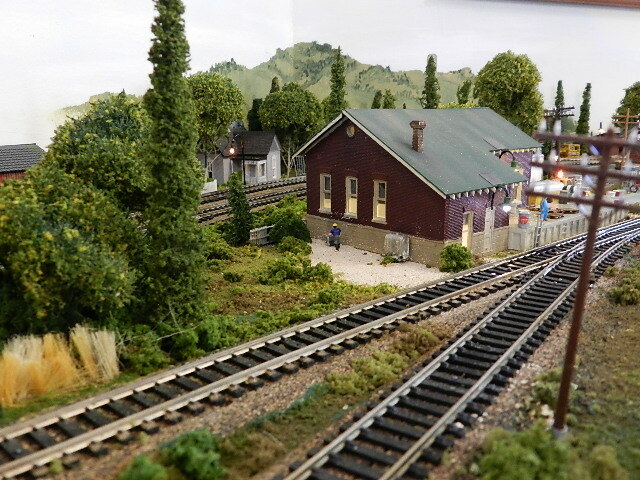 In all, it serves three separate branch lines from it’s base as well as making local runs to Geneva Steel and Ironton. The model is a Nickel Plate Products brass model produced many years ago. 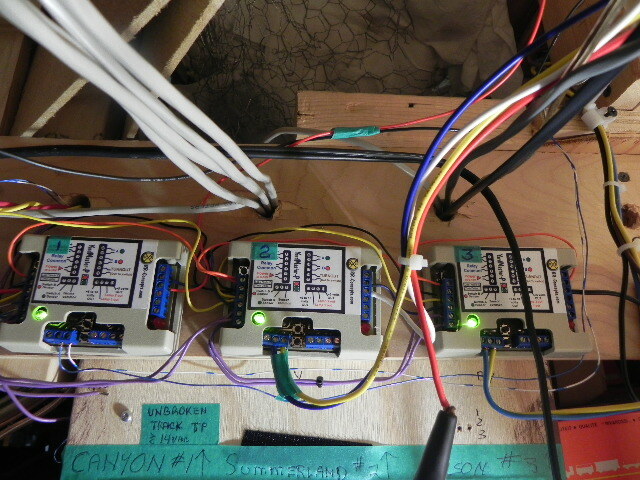 It now sports a can motor with flywheel and decoder. 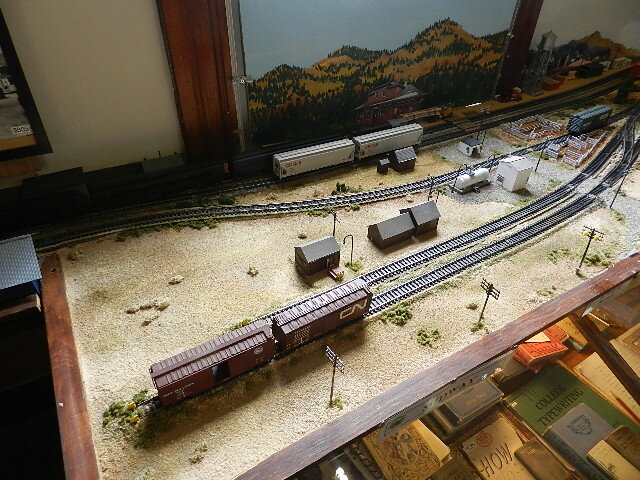 On the adjacent track is a caboose from the now predominate diesel era, a ready to run Athearn model. 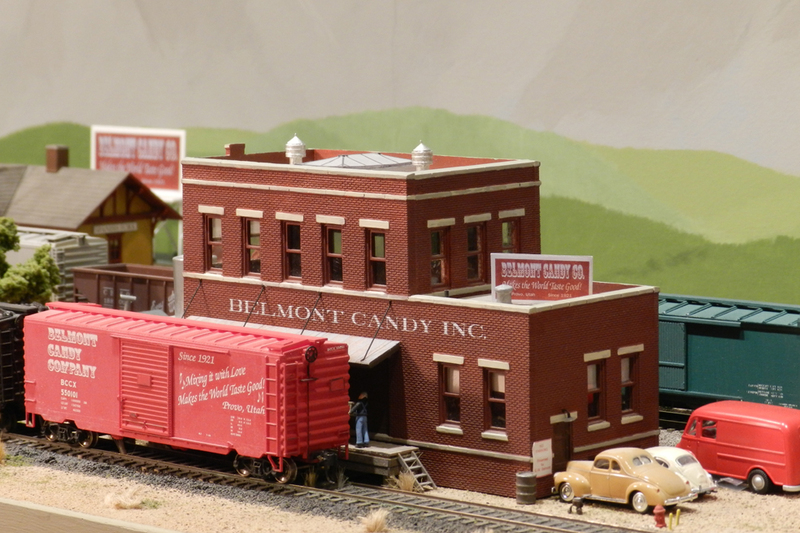 The Belmont Candy Company crew is hard at work on their loading dock, putting the last few boxes of sweets into one of two BCCX company owned cars. 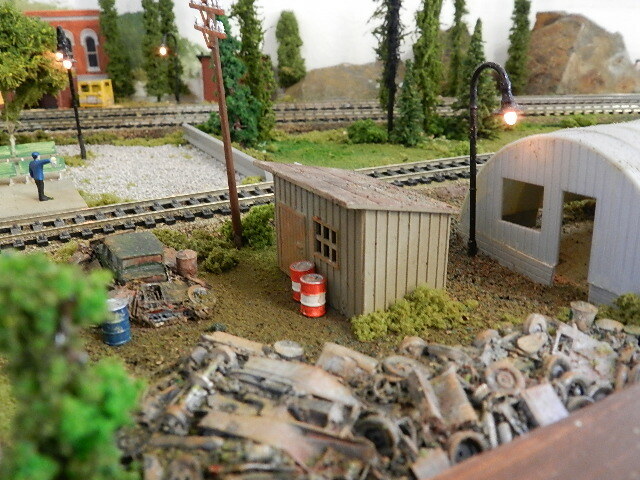 The structure is a Design Preservation Models, Cuttings Scissors kit, a gift to Dave from a dear friend who also designed and printed the decals for the kit, numerous signs on the module including the colorful Belmont Candy Company signs and the decals on the Accurail box car. 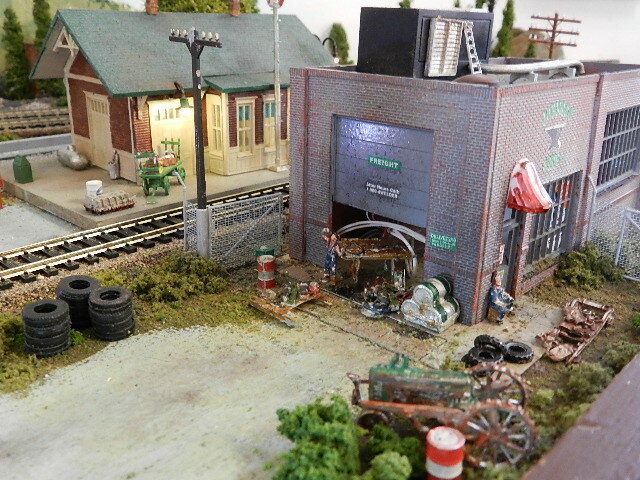 Dave added the loading dock and canopy, plus various other items and details to the otherwise simple kit. No Belmont Candy Company in the real Spanish Fork, but the name has a special meaning and Dave has a story, too long to relate here, all about it’s origin, how it fell onto his module one day, and the people involved. As such it occupies a special place on the module and is a busy industry to serve. 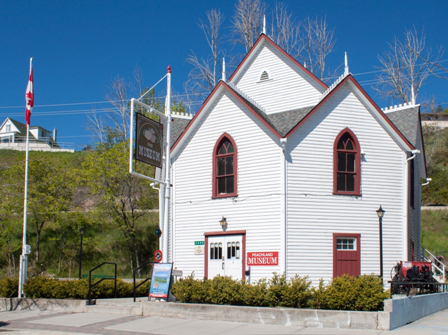 There’s always plenty of action in Lower Summerland. The big mill is a scene of immense activity. Powerful trucks carrying loads of logs beat a steady path through the mountains and down to the Mill. Saws saw, chippers chip and the machinery of the lumber industry goes on 24/7. There might even be a train dropping off cars for us to load. Not today though. Today we ship our lumber out by boat. The lumber leaves the mill and heads down Old Logging Road towards the offices of the dock yard. They’re expecting us so the sorting and the transfer is easy. Some will leave by train and some will be sent down the lake by barge. The crew at the yard office doesn’t hang around there full time. Train and barge service are both scheduled so guys from the mill can be down there when needed. Some days are short and some are long. The mill has it’s own office down at the yard making it easy for customers to pick up a few things directly as soon as they’re brought in by that same train or the same barge and tug boat service. At the water front the tug boat has just delivered a outside braced boxcar with parts for the mill. A plainer has been down for over a week and the boys are anxious to catch up on their hours. The barge service also moves small, hand carried items when needed. Less-than-carload invoices are not uncommon and even small items can be vital. Away from work, the shore line is a busy place in the summer as well. The trail down to the lighthouse is dangerous but it never stopped a local from enjoying a day at the beach. After many attempts our local group has finally made the big time. We took dozens of photos, night and day, and from every conceivable angle and attached them to a story line that caught Morgans attention. We’d tried in the past but the magic of digital photography got us to the finish line. In the end he chose the pictures that he felt best told our story and that’s what it’s all about. He also gave each of the club members a copy for their own brag wall. Nice. 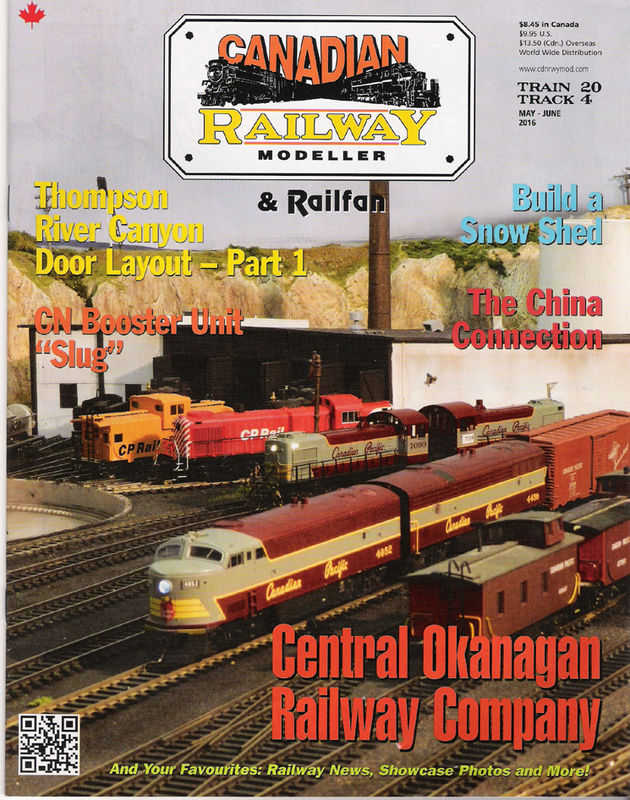 This issue hit the stands just as the Selkirk Express was getting underway in Salmon Arm BC and we hosted over 125 of their guests who bused down to pay us a visit. Thanks to that great NMRA group for putting us on their itinerary. So there you are. Find a copy at your local hobby shop and see us in print. It’s actually easier and nicer that what you see on this screen. More to come. We have finished a few projects you’d be interested in. 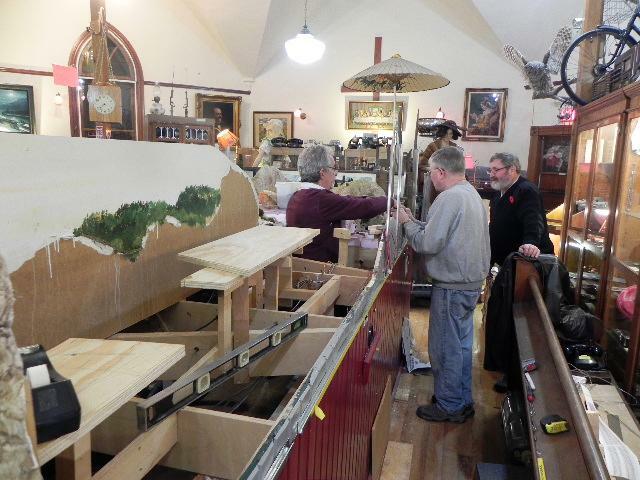 The group at CORC spent most of yesterday completing the scenery on the Midway display while keeping the coloured photos of the small yard taped up right in front of us. 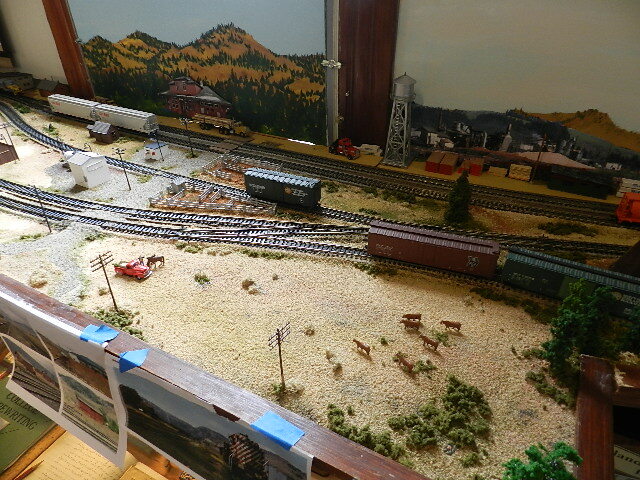 As stated earlier, our goal was to recreate a vast flat, open grassland with railway tracks. Even the few small buildings could make the large shelf look like a city. We would have to be very careful. As seen from the right hand end, the ‘west’ end, you can see three or more tracks heading off to the left and the one, lower track that leads into the lumber yard and sawmill. We maintained the ‘open’ theme by installing a small herd of cattle in the space and a single pickup truck far to the left. Utility poles actually help create the impression of emptiness. On the left side of the display there is more empty space. Almost lost in that space are the 5 small CPR sheds we found in photos taken in the mid 60’s and the two white structures that make up the refueling facility. From a lower angle the visitors can see the open grassland stretching off to the west. 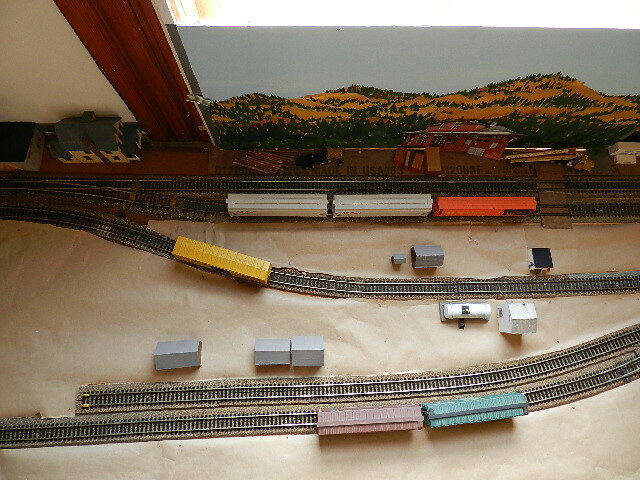 All of the buildings are in their correct location based on early photos with the exception of us having to leave out two tracks and pinch the scene to some degree. The fuel facility is our best guess in many ways. We have some photos of the larger two story building but oddly, all of them are taken from the same side. Nothing is seen of the west or north sides. There were photos of at least two different fuel tanks and one of the tank support minus the tank. All of the pictures we have were taken after the stock yard was abandoned and in disrepair. It was simply easier for us to build it as a functioning facility that we could use during our operating evenings. Over the next few days we will tie up the new wiring harness going to the lights and the smoke generator used in the sawdust burner. So as this project comes to an end we will be looking at other large displays around the museum and trying to recreate some semblance of reality. Something visitors will recognize. Greenwood is done, now Midway and by spring I expect to be well into fixing Grand Forks. Much anguish resulted in the decision to strip Midway of it’s eclectic collection of ‘stuff’ and rebuild it into something vaguely representing the little town at Mile 0. There really wasn’t a great deal to see there. Not a great deal going on. Just a lovely CPR station on a broad, flat, dry spot in the mountains with it’s accompanying fuel tank, lumber mill, stock yard and a M of W track. That was what attracted me the most and that was what scared off many others. 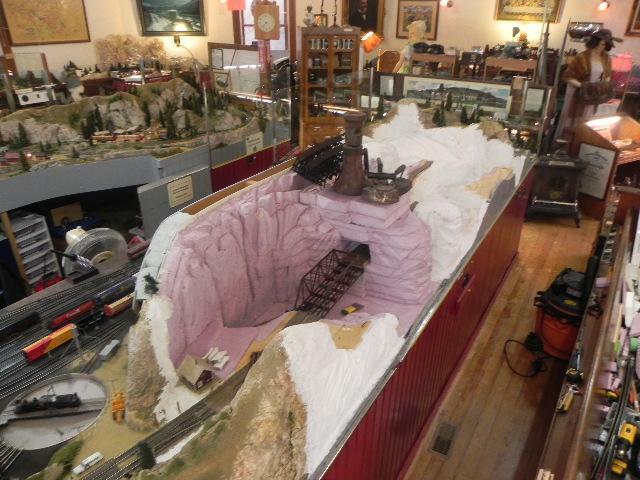 Would we lean towards a model railway or would we lean towards a museum piece? Eventually we came to some accommodation. All the old junky quasi-European buildings would go. All the North American items would stay. Well, at least some. The new Midway didn’t need a dozen logging trucks and an equal supply of lumber. As can be seen, Midway didn’t need much but it was a great place to model and, if done right, would offer a great scene for the visitors. Other pictures showed us where the loading pens were and where the fuel tank was. You can see the lumber laid out on the ground here and there. The station is getting a new roof. 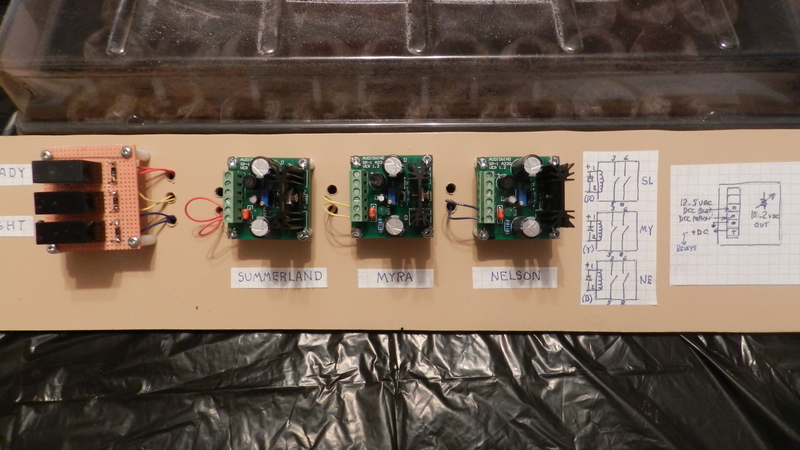 First things first, we needed to extend the original Midway display in order to fit in a usable siding. One that would leave the confines of the station and push into the yard. Much of the activity at Midway was done in sidings. Our work would have to be done using spur tracks – and only two at that. Seen above, the third track around the museum was pushed down into the new space left behind by tossing the old buildings. 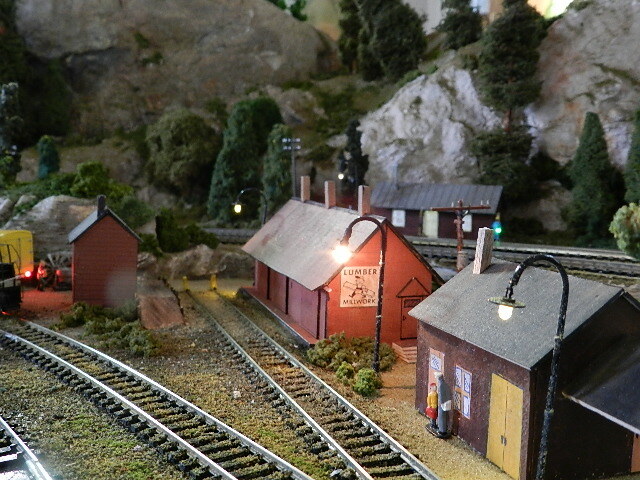 The small railway buildings were photographed, measured, built and set in their appropriate location. 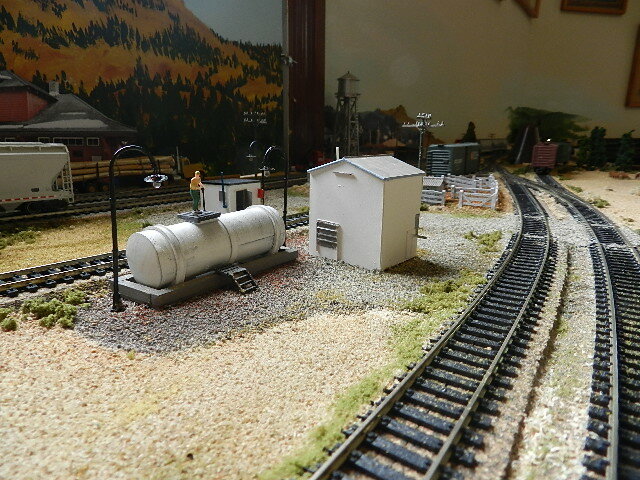 The fuel facility was installed right across from the station. Two dead end tracks would have to suffice for all of the rest of the day to day Midway activity. The station BTW would be scratch built of course but only be the front 1/2 simply because there was very limited room between the museum window and track #1. It worked for us in Nelson. Farther ‘west’ we reworked the original turnouts into the new track #3. 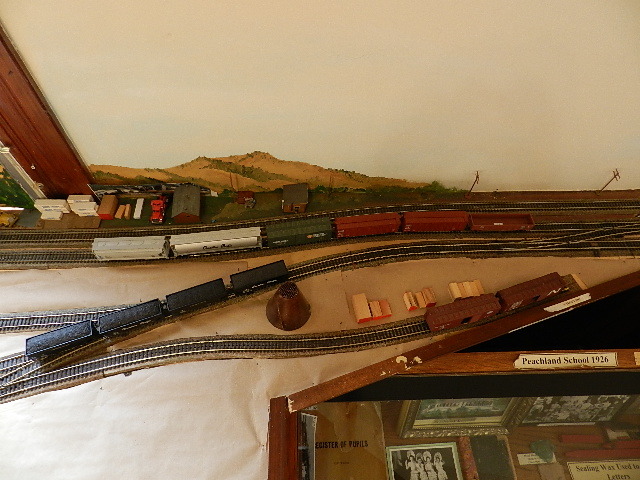 Two direct track to the spurs seen previously and one heads to the right (East) into the new sawmill area built onto the original shelf display. This was done with no thought to fitting a known sawmill into the space but rather we would simply build a mill to what ever size the new shelf extension offered. So, this is what we have. The sawdust burner has to be filled with smoke fluid so it needs to be ‘up front’ where it can be reached and the car loading needs to be near there as well. That leaves us with a few inches of space at 7 o’clock from the burner, the little unused space on the right where cars are loaded and the back wall of the museum. We have some nice photos of sawmills, large and small, so we’ll use the best, get them copied at 2 or 3 times the photo size and place them against the wall. I’ll add a few bits of pipe here and there and a large ‘over the track’ walkway with a mass of pipes that connect the lower wedge of space to the mill itself. That should create a compact, busy industrial area with lots of lights, noise and smoke while retaining the hot dusty prairie atmosphere of the station area. We’lll keep you up to date. ….although I’m sure there will be additions here, there and everywhere. A car and some flashing lights I expect. Lets see how it goes. We should take a quick tour around town and ask for suggestions. We’ll drop over to the station first. It’s a busy little place. Quite idyllic actually. A few passengers sitting in the sun and an old dog waiting to go home. But it’s in a rather run down neighbourhood. The scrap metal dealer is right over the tracks. and his back yard isn’t any better than the front. But it’s been seen by fewer people and thats’ a good thing. Right across the street from the station is the bulk oil dealer. Well every small town has one and I guess they have to be somewhere. And next door to the oil shop is the town machine shop. They probably get a lot of their stuff from the scrap guy over the road. The country side open up behind the bulk oil and starts to resemble why we like it here. Birds, the sound of the creek and the wind in the trees. That track on the right leads off into the small servicing facility. That small shop gets to be a busy place from time to time as there is nothing else between Grand Forks and Midway. An over view shows off the very best of Greenwood. It’s a place where you can let your kids run free and the neighbours will keep an eye on them. 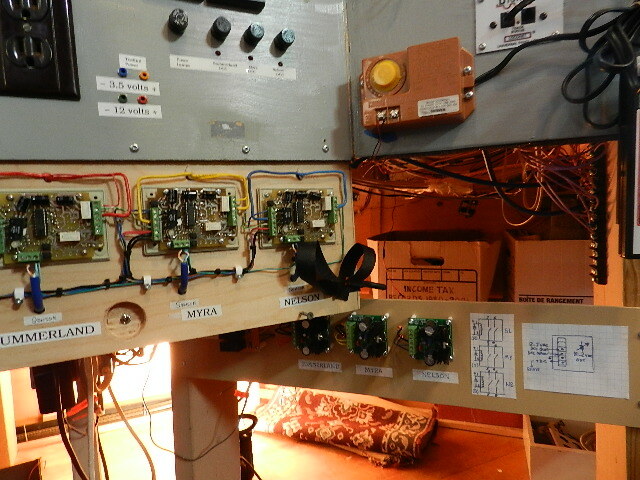 So, except for that flashing x-ing light at the station track we’re pretty much done here. Moving on the Penticton and Nelson next.